For a broader coverage related to this topic, see Peer production. 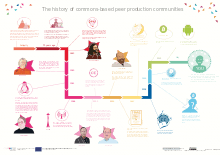 Commons-based peer production is a term coined by Harvard Law School professor Yochai Benkler. It describes a new model of socioeconomic production in which large numbers of people work cooperatively (usually over the Internet). Commons-based projects generally have less rigid hierarchical structures than those under more traditional business models. Often—but not always—commons-based projects are designed without a need for financial compensation for contributors. 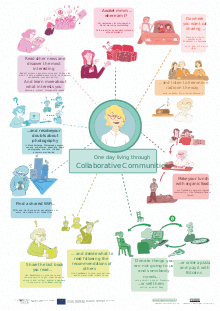 commons-based peer production refers to any coordinated, (chiefly) internet-based effort whereby volunteers contribute project components, and there exists some process to combine them to produce a unified intellectual work. CBPP covers many different types of intellectual output, from software to libraries of quantitative data to human-readable documents (manuals, books, encyclopedias, reviews, blogs, periodicals, and more)." Customization/Specialization: With free and open source software small groups have the capability to customize a large project according to specific needs. With the rise of low-cost 3-D printing, and other digital manufacturing techniques this is now also becoming true of open source hardware. Some believe that the commons-based peer production (CBPP) vision, while powerful and groundbreaking, needs to be strengthened at its root because of some allegedly wrong assumptions concerning free and open source software (FOSS). The CBPP literature regularly and explicitly quotes FOSS products as examples of artifacts “emerging” by virtue of mere cooperation, with no need for supervising leadership (without «market signals or managerial commands», in Benkler’s words). It can be argued, however, that in the development of any less than trivial piece of software, irrespective of whether it be FOSS or proprietary, a subset of the (many) participants always play -explicitly and deliberately- the role of leading system and subsystem designers, determining architecture and functionality, while most of the people work “underneath” them in a logical, functional sense. 1 2 Coase's Penguin or Linux and The nature of the firm 112 YALE L.J. 369 (2002), PDF. ↑ Benkler, Yochai (2006). The Wealth of Networks. Yale University Press. pp. 73–74. ISBN 978-0-300-11056-2. ↑ Benkler, Yochai; Nissenbaum, Helen (2006). "Commons-based Peer Production and Virtue". The Journal of Political Philosophy. 4 (14): 394-419. Retrieved 22 October 2011. ↑ Krowne, Aaron (March 1, 2005). "The FUD based encyclopedia: Dismantling the Fear, Uncertainty and Doubt aimed at Wikipedia and other free knowledge sources. Free Software Magazine. 1 2 3 4 Benkler, Yochai; Nissenbaum, Helen (2006). "Commons-based Peer Production and Virtue" (PDF). The Journal of Political Philosophy. 4. (14): 394–419. Retrieved 22 October 2011. The Foundation for P2P Alternatives - Functions as a clearing house for open/free, participatory/p2p and commons-oriented initiatives.